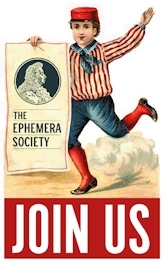 The Ephemera Society is a non-profit body devoted to the collection, conservation, study and educational uses of handwritten and printed ephemera. The term ephemera covers a wide range of documents including leaflets, handbills, tickets, trade cards, programmes and playbills, printed tins and packaging, advertising inserts, posters, newspapers and much more. In the words of the societys founder, Maurice Rickards, the minor transient documents of everyday life. Essentially produced to meet the needs of the day, such items reflect the moods and mores of past times in a way that more formal records cannot. Collectors of printed ephemera vary in their approach. Some focus on the ephemera of a particular trade or profession, others are interested in its social or graphic history. Other ephemerists collect documents simply as evocative reminders of the past.